North Ayrshire Penguins v Kilmarnock Tornadoes U12’s – Scottish Cup Semi-Final, Galleon Leisure Centre, Kilmarnock. Saturday saw the North Ayrshire Penguins take on Kilmarnock U12s in an important Semi final game of the Scottish Cup. Glad to say the Penguins did not disappoint! The opening goal from #18 Adam Bainbridge some 2 minutes in set the pace for the Penguins, & was closely followed by another 4, ending the first period 5 – 0. Penguins net minder #1 Caiden MacColl kept Kilmarnock from scoring in what proved at some points to be a busy shift. Jacob Woods #10 added to the Penguins score line within the first two minutes of the second period. Frustration seemed to be setting in with Kilmarnock as the penalty minutes started creeping in. Both teams went for a change of net minder half way through the second period, by this time the Penguins were 9 – 0 up. 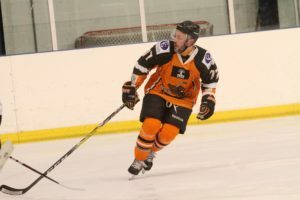 The Penguins retained there pace continuing to add to the score line, Kilmarnock #8 Gregor Donaldson broke away and scored their first goal. The score at the end of the second period was 13 – 1. The third and final period started in Kilmarnock’s favour with #5 Torrin Maclachlan scoring within the first 30 seconds, the Penguins didn’t let up with another 5 goals in past Kilmarnock’s net minder. Kilmarnock’s #8 Gregor Donaldson made for another break away and once again got past Penguins net minder #33 Calum Simmonds, this was closely followed by a cheeky goal by #19 Ruby Newlands. The penguins found time for just one more past the net making the final score 19-4. 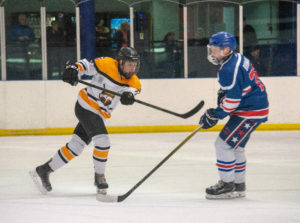 Fantastic team work on display for the Penguins earning them their place in the Scottish Cup final which will be held on Saturday 11th May at Dundee Ice Arena. North Ayrshire Sabres v Ayr Bruins U10’s. Auchenharvie Leisure Centre, Stevenston. North Ayrshire Sabres took on Ayr Bruins U10s in this exciting fixture. The North Ayrshire net was under bombardment from the off with Goalie Jake Reilly having to turn away quite a few shots in the opening minutes. The game continued at a fast pace with some excellent plays from both teams. Unfortunately the Bruins were a stronger team and the game finished 7-0 to the Bruins but there was a lot of positives that the North Ayrshire kids and coaches can take away from their performances. Man of the match awards went to both net-minders who both had an outstanding game. Well Done Jake Reilly Man of the Match. 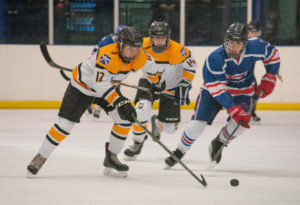 North Ayrshire Predators v Dundee Stars U16’s. Auchenharvie Leisure Centre, Stevenston. 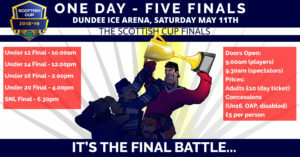 Period one was a close fight between both teams & it ended 1-1 but could have been a lot more for Dundee. 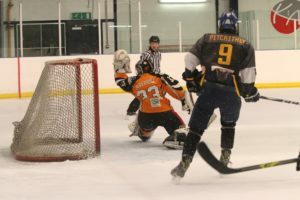 The Predators goalie Harry Campbell did well in keeping so many on target shots out of the goal and the team gave Dundee a run for their money, maintained their discipline, effort and can do attitude. The 2nd period proved a much stronger period for Dundee and this well drilled team took full control the game. There was plenty of action and Dundee’s players saw a fair amount of time in the sin bin, at one point 4 of their players were in there. 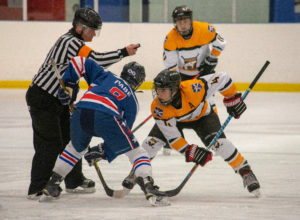 A tough period for the Predators that ended 8-1 to the visiting side and the Predators goalie Harry was injured late on with a shot to the neck. North Ayrshire Wild v Kirkcaldy Kestrels (SNL). Auchenharvie Leisure Centre, Stevenston. The Wild took on Kestrels with a 4 goal loss from the 1st leg. and what a game this turned out to be. In the first period Wild were all over Kestrels and it was Wild who claimed the first goal & 12 mins later the Wild their 2nd goal, and tried hard to hold that score till the end of the 1st but it wasn’t to be when Kestrels pulled one back at the 18 min mark, this saw the period end 2-1 to the Wild. Into the second period, the Wild were buzzing and get an early 3rd goal. Both teams put up a great display of skill and commitment and this period ends 3-1 to Wild. The 3rd period saw more of the same with play going from end to end, with Scott Beverage playing a stormer of a game in the Wilds nets, the Kestrels applied more pressure and pulled a few goals back making it 4-4 then it went again, from side to side with goals being scored by Wild only to be answered seconds later by the Kestrels….. 5-4, 5-5, 6-5, 6-6 ,7-6 and finally ending the game on 7-7. It was a terrific display of hockey with the spectators really getting to see hockey being played at its finest. 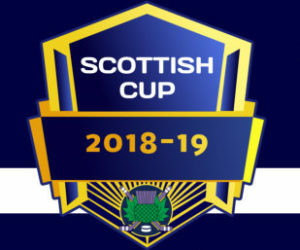 ← 3 x North Ayrshire Boys Make Scotland Conference Teams.